Compare the scene with what Chief Election Commissioner Nasim Zaidi said last week in Imphal. He said, Dry Manipur should remain dry in letter and spirit. SEKMAI: In “dry” Manipur, it is not just electoral politics that is getting this Assembly segment high. When it comes to the 16th Assembly constituency called Sekmai, located some 20 km from capital Imphal, there is more than one reason that the name rings bells across the Northeast. Sekmai also means the most famous local brew of Manipur. As the battle of ballots between ruling Congress and resurgent BJP gathers momentum, there is a free flow of the local brew not only to different pockets of the constituency but also to poll agents to carry it to the rest of the State to quench sekmai-thirsty voters. Kh. Tomba Singh has never made better business in the last five years. These days, he is busy with orders from impatient and eager poll agents cutting across party lines and from across the State. “I am doing brisk business. You can say my business has risen three times. The agents of the political parties have been milling around here for the past few days to place their orders and carry home the drink,” he said. As the French town Cognac derived its name from the local drink by the same name, this scheduled caste-reserved constituency of Manipur got its name from sekmai. Previously, the village was known as “Sengmai”. 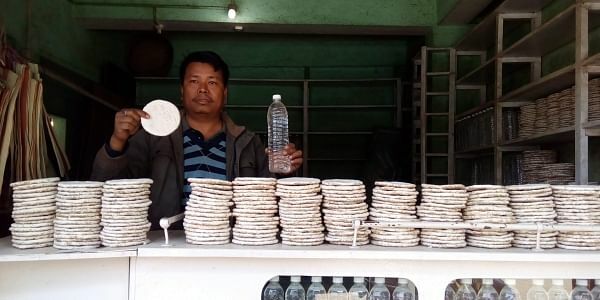 Japanese engineers and officials, who had briefly stayed in Imphal in the 1990s to launch the Manipur government’s sericulture project, which was funded by Japan, compared sekmai with the country’s most famous local brew ‘sake’. There is no ban on the sale and consumption of sekmai but its carriage to other parts in large quantities is prohibited. It is popular not just in Manipur but across the Northeast. “Sekmai is prepared with local rice and the stems of a creeper plant called “yangli”. The yangli stems are kept in water for a few days and later, the water is mixed with ground rice to prepare hamei, which is usually given the shape of a chapatti. Subsequently, boiled rice and hameis are mixed and fermented for five to six days. The whole process ends in about 10 days with distillation. The distilled water is called sekmai,” explained retired engineer Kh. Gambhir Singh to Express. Local drinks “andro” and “phayeng” are prepared elsewhere in the State but locals claim they are no match for sekmai. “It (sekmai) doesn’t have any side effects. There is no chemical used in its preparation. This is a pure drink,” said A Robin, a local. According to locals, sekmai is used in all events - during the birth of a child, death of a person, marriages, festivals and the performance of rituals. The constituency has around 20,000 voters, out of which some 5,000 are settled in Sekmai village. According to Robin, nearly 3,000 of them, mostly women, eke out a living by engaging themselves in the preparation of sekmai and selling it. The locals are believed to have migrated here from Thailand centuries ago. Meanwhile, the constituency is all poised for a straight fight between sitting MLA Khwairakpam Devendro Singh of the Congress and Heikham Dingo Singh of the BJP. Others have not fielded candidates here.